Christmas dinner this year wasn’t much different to what I’ve made before. 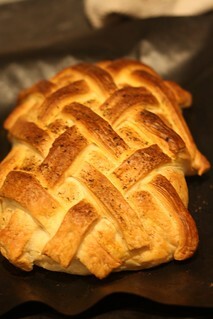 I wrote about the starter on my other blog here but for the main course as usual I made Seitan en Croute. I love using this a centrepiece, not least because I like using the leftovers with chips and coleslaw on Boxing Day. It’s not too difficult or time consuming, works perfectly every time and the flavours match the rest of the meal perfectly. I do keep intending to stuff the seitan before cooking it, but I haven’t yet tried it. For the rest of the meal I stayed very traditional. Roast potatoes, of course. Yorkshire puddings, I’ve tried a number of versions but I think this one might just be the best yet (I used Pura white fat in the tray rather than margarine). Stuffing balls. This year I stuck with a fairly traditional sausage based recipe based on Nigel Slater’s (warning – the link goes to a goose recipe). I used Sainsbury’s meat free sausages and changed the mint for sage. Bread sauce. I use Delia’s recipe, just making the obvious vegan replacements. Broccoli, Creamed leeks with bacon (I just used Redwoods). Gravy. I used the recipe from American Vegan Kitchen. It’s a great basic gravy which is highly flavoured but doesn’t overpower the rest of the meal. 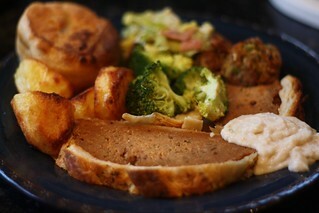 The picture below is the whole meal before it was doused with gravy. Christmas is the only time of the year when I ever cook a roast, but I love it just for that one day. I’ve really enjoyed joining in with Tami’s Food Network Fridays and had some fantastic food I’d never have tried without it, but I agreed with her that it was probably time to try something new. I was delighted when Kelly volunteered to take over, with a new spin on it. I had never seen or even heard of the programme Kelly chose for June, so when I looked it up on the internet I was amazed to see that it started airing on the UK version of Food Network that very day! How weird was that? Before I’d even seen the programme I knew I’d be tackling Banh Mi first. 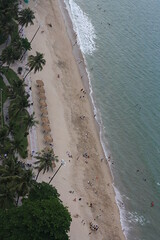 I have tried a few versions before but I wanted to exactly recreate the version we loved so much in Vietnam. 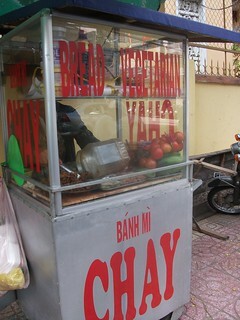 Almost the minute we arrived in Nha Trang we went off in search of this vegetarian Banh Mi stall. 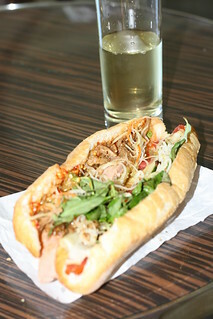 Everyday we would go and pick up fresh made Banh Mi and have them with a beer or glass of wine for lunch. Beautiful fresh made spicy sandwiches for just 30p each. Having visited the Vietnamese shop I mentioned in my last post I had some herbs to use so it was the perfect time to try my recreation. The lady on the stall used 3 different types of seitan but I just stuck to 2. I used some sliced seitan that was a tester for Tami and Celine’s book for the thinly sliced stuff on the right of the picture. For the chunkier stuff on the left, I used the recipe for Asian Seitan Crumbles from 500 Vegan Recipes. I made them as directed (and they’re really simple and quick), but then tossed them in a little bit of hoisin sauce and sprinkled them with sesame seeds. Left to go cold, they had a beautiful crisp texture and taste that were a perfect recreation. Unfortunately I can’t buy anything that is close enough to the texture of the Vietnamese baguettes. Books will tell you to use French baguette but it’s not really the same. Another time I will try to make something myself but this time I just used some bought fresh bread slices (I put a slice on the top of the sandwich too after I took the photograph). The lady on the stall didn’t use any mayonnaise, but I reckoned that if she’d had easy access to a vegan version she would have done! So I mixed some mayo with sambal oelek and used that to spread on the bread. 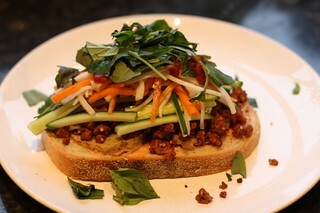 I then used 2 slices of seitan per sandwich and piled on the crumbles – I used the whole recipe for 2 sandwiches. After that, the sliced cucumber and the lightly pickled shredded daikon and carrot. Finally, a tangle of Vietnamese herbs and a massive big blob of sambal oelek. This was a brilliant sandwich in its own right but I was particularly pleased with how much it tasted like the version I was trying to recreate. 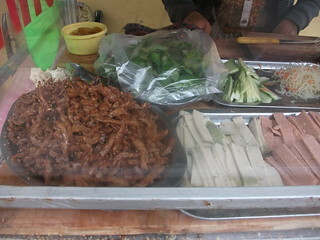 The 3 crucial elements were the seitan crumbles, the Vietnamese herbs and the sambal oelek (NOT Sriracha). Eating it in my lounge on a very chilly and wet evening was not quite like eating it with the view below in front of me, but it came very close!